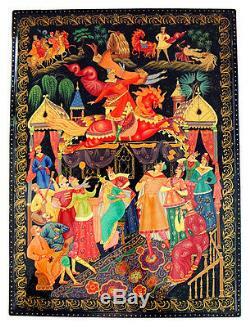 Russian tale the little hunchbacked horse. Dimensions: 32 cm x 24 cm x 7 cm. 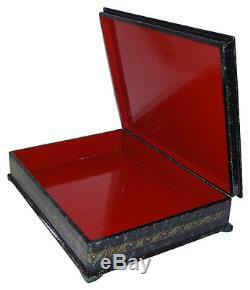 Russian lacquered box - a very beautiful object to enrich your collection or an unforgettable gift to offer! Lacquered box collection of the school kholoui. The art of miniature lacquer is a unique genre of decorative art. The first Russian lacquers date back to the beginning of the eighteenth century. Four small towns of moscow, renowned for their icons, gave birth to the lacquered miniature: they are known today as four schools of Russian painting: fedoskino, kholouï, mstéra, palekh. These factories are recognized as very representative of Russian national craftsmanship. 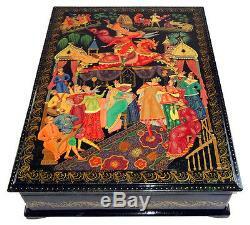 The item "lacquered box collection kholoui Russian tale the little hunchbacked horse Russian box" is on sale since Wednesday, November 7, 2012. It is in the category "art, antiques \ objects of the twentieth, recent". The seller is "wonders-russia" and is located in rosny sous bois. This item can be delivered anywhere in the world.